It’s not Christmas around here without a viewing of “A Charlie Brown Christmas” on TV, and this year is a special year. It’s the 50th anniversary of the show! It’s so fun to me as a parent to share things with my kids that I loved as a child, too. Teleflora is joining in the celebration with two gorgeous Peanuts-themed flower arrangements. 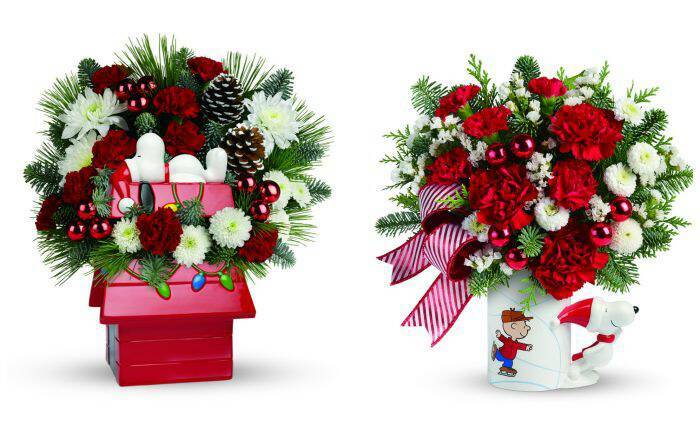 This season Teleflora joins Charlie Brown, Snoopy, and the rest of the Peanuts gang in celebrating the 50th anniversary of one of the most beloved holiday favorites of all time, “A Charlie Brown Christmas.” Teleflora, the world’s leading flower delivery service, pays tribute to Charles Schultz’s unforgettable TV special with two exclusive floral bouquets and a festive line-up that is sure to delight everyone on your holiday list – from your blanket-toting bestie to your bossy big sister. 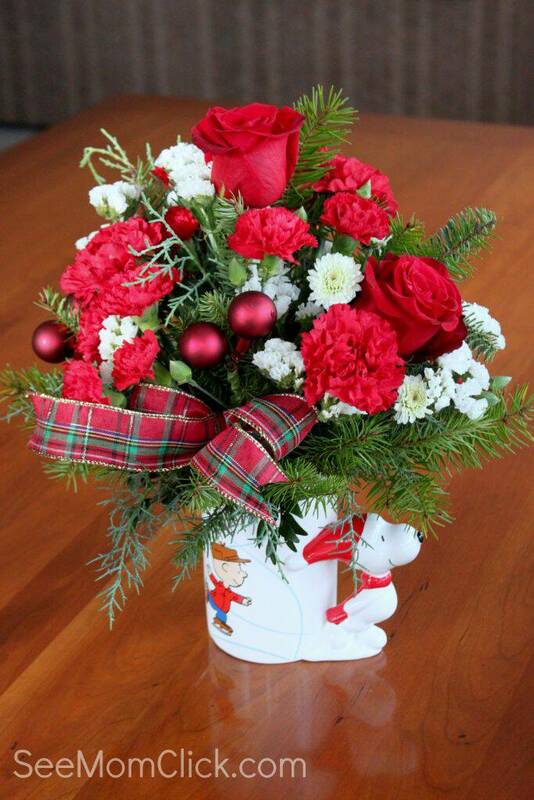 Ideal for gifting, entertaining and decorating, each bouquet arrives professionally-arranged by a local florist and is presented in a keepsake holiday container that is sure to be cherished for many Charlie Brown Christmases to come. I was sent one to review and share with you and I chose this Snoopy mug arrangement. Not only are the flowers stunning, but the mug is a keepsake too, after the flowers are gone! How gorgeous are these flowers? They’re a perfect gift for someone special, and a beautiful centerpiece for your Christmas table. I keep moving them around the house so I can always see them. I just love the colors and there’s something about fresh flowers that instantly cheers me up. And when the flowers have lived out their life, this will be happening. Hot chocolate, Snoopy style! Check out these pretty arrangements on the Teleflora site, and be sure to follow them on Facebook and Twitter to keep up with some of their fun, themed arrangements. Sending flowers never goes out of sytle! Teleflora is generously offering one of my readers a Peanuts-themed floral arrangement…winner’s choice between the two styles shown in this post! And I’ve teamed up with She Saved on this promotion so we’re going to be picking TWO winners! This is a quickie so we can try to get it to you before Christmas. So enter before the giveaway ends at 11:59pm ET on Tuesday December 15, 2015. Open to US residents ages 18+ only, please. When I think of Snoopy, I think of his dog house. I would choose the dog house arrangement. I hope the arrangement comes with roses like yours did. I like both. I like the Snoopy Cookie jar. I also like the mug too. They are so adorable. I’d pick the Snoopy’s cookie jar arrangement. I’d pick PEANUTS® Christmas Mug by Teleflora. I love the doghouse floral arrangement. It is very cute and such a sweet reminder of Snoopy. I think the Snoopy Mug arrangement one is my favorite, so pretty. I love them both but I would choose the Snoopy Dog House arrangement because my granddaughters would love having Snoopy on the Cookie Jar! i would choose the snoopy mug or the snoopy dog house arrangement. They are both adorable! I think I would go with the coffee cup arrangement because my kids would get a kick out of drinking from it. I’d probably get the dog house cookie jar. I love the cookie jar! I will pick snoopy mug, so I can reuse the mug for my coffee, kids will be very jealous. I would choose the red dog house for sure! Then, since I love my coffee and hot cocoa, I would go with the fun mug! Thank you for the chance. I would choose the snoopy house cookie jar. I love the snoopy cookie jar, but I would be grateful for either one! I would choose the mug. I would choose the Snoopy mug. I can use it for hot chocolate after I have enjoyed the flowers. Love the doghouse floral arrangement and snoopy mug! My grandmother lives alone and these would definitely brighten her day! I would choose the Peanuts Christmas Mug! I would choose the mug, it’s so cute & I LOVE coffee! I would love to receive the Snoopy Christmas Dog House. It’s wicked cute. I would pick the cookie jar My husband’s mom collects cookie jars this would be perfect her. The same as you, the Snoopy Mug! I would choose the red dog house. The arrangement with the mug would be perfect as we are a hot chocolate addict family. I would choose the Snoopy and his dog house, it is so cute!